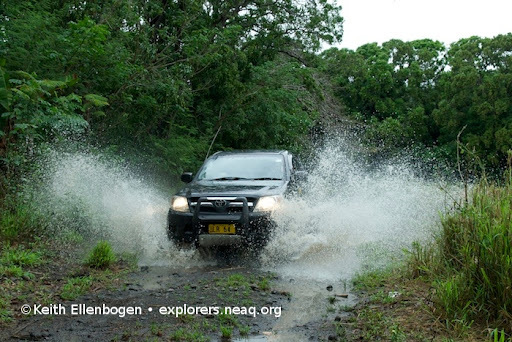 While everybody else packed off to Nadi International Airport, Stacy, Keith and I packed--and I do mean packed--into a station wagon taxi with all our gear for the drive east along the Coral Coast, toward our final adventure on this expedition. Keith and I checked in for a decompression stop in Pacific Harbor at a favorite spot called "The Uprising." Stacy soldiered back to Suva to embrace reality. Rain had started and quickly grown torrential. Stoic cruise ship visitors paraded by in the rain, barely clad and in fleshy abundance, as Fijian farmers coast to coast celebrated a welcome reprieve from the cursed grip of drought. There would be crops in the dry West of Viti Levu. There would be food and trade, after all. That night our guests for dinner were James Comley of the University of the South Pacific, and Stacy. James heralded the reconvening of the Fiji Marine Management Area Science Team for a two-day venture to our study area on the north coast of Viti Levu, to be documented photographically by Keith Ellenbogen. This area is actually the first landfall south of our dive trek through Bligh Water, and those waters are largely claimed within the qoliqoli, or marine management areas, of the villages along this coast. Soon our rented HiLux truck was jammed to the gills with people, gear, and waka for our village visits, and we were off, en-sheathed in rain. The villages we were visiting are all participants in a plan to restore the coastal native rainforest of northeastern Viti Levu, in the Nokoratubu and Rakiraki districts. These lovely, scenic hills, drenched in magnificent forest within the memories of village elders, now stand stark naked, crisped by frequent fires set in accidents and bouts of boredom. 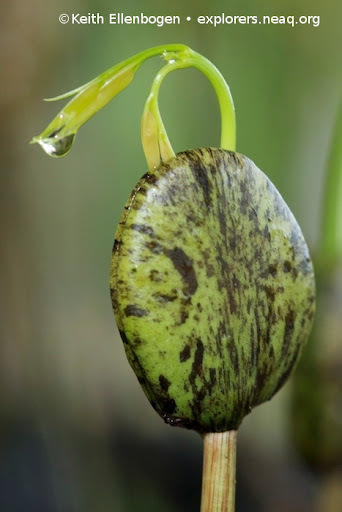 When rain pours from the sky, mud pours from the land into the sea, Earth’s blood shed away carrying precious nutrients that would otherwise have nourished a dalo plant or a tree, and in turn, the people of Fiji. That mud slides over coastal reefs, cutting off the sun, choking corals and their associated denizens, and fueling harmful algal blooms. There is a solution: put the trees back. Restore the native forest. Keep steeps and highlands and river corridors under old, closed-canopy forest. Rebuild corridors from mountaintop to beach to maintain all of Fiji's beautiful animal and plant species--a quarter to a third of which or more occur nowhere else in the world. Further enhance forest services by including extensive plantings of commercial timber as one of the crops. Food crops will be freer of pests as birds and other farmers' friends mass in the adjacent plantation and natural forests. The beauty of the scenic landscape will be restored as well, boosting tourism and revitalizing Fijian culture. So many trees have been cut that great forest trees that play a crucial role in traditional practices and arts have been brought to the verge of extinction in Fiji. Fiji forests host hundreds of woody plant species, many providing fruits to eat, flowers to string on welcoming garlands, and gorgeous woods. No tree is more emblematic of this threat than the beloved (and beloved to death) vesi, known to scientists as Intsia bijuga. Vesi is one of the lofty and majestic rainforest trees in a group of plant families closely related to the common garden pea. It is from large vesi trees that artisans carve the tanoa, or kava bowl (seen in this previous post), that is the most familiar icon of Fijian hospitality, philosophy and way of life. Its beautiful and durable wood is the luxurious wainscoting of Fiji’s built environment. 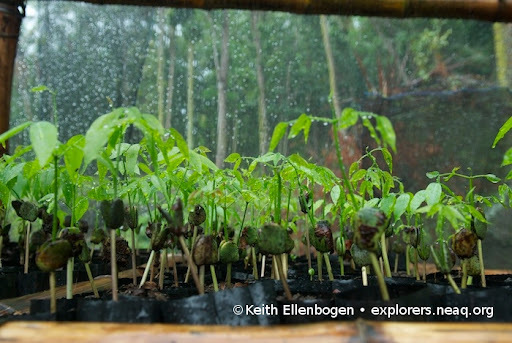 Accompanying vesi in the CI nursery are at least a dozen other popular and important native tree species. One is the great dakua or Pacific kauri, royal conifer of Fiji ridgetops. Ivi or Polynesian chestnut is another. Lowland rivers are naturally sheltered by ivi, whose lovely russet buttresses paint and shape the riverside, and support a lush canopy that annually bears bumper crops of prized edible nuts. Ivi also dangles its roots like wet toes in the river, creating habitat for brilliantly hued freshwater gobies new to science and unique to Fiji; some exist in only a single river or watershed. 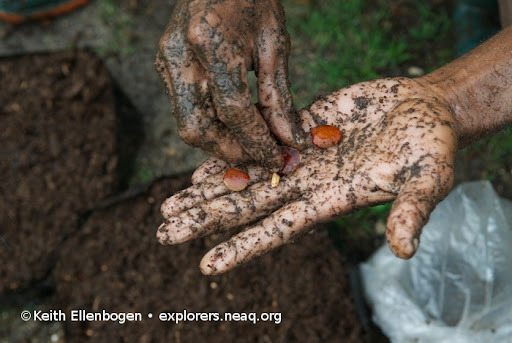 Native trees are not the only species planted; nearby, with help from Forests for the Future, teak are mass-produced as a crop that delivers far more than cash. Forests for the Future is the brainchild of Rodrick Evers, who co-owns and manages the Five Princes Hotel (where we stay in Suva) with his wife Tari, daughter of a former high official in Kiribati when it was under British rule (see Aquarium blogs about Kiribati and the Phoenix Islands). Carefully rotated instead of being cut down all at once, teak like any tree can help prevent erosion and topsoil loss. As we learn more about intercropping and polyculture, teak can also provide an additional habitat with value for wildlife and endangered species, a valuable second string to native forest. Also, teak prefers drier conditions than most native rainforest species, and can be used as a habitat buffer around the periphery of native and restored rainforest. 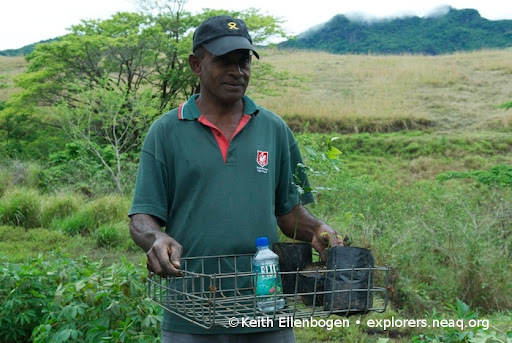 The past few years have seen a burst in reforestation activities in Fiji, linked to both biodiversity conservation, and long-term human welfare. 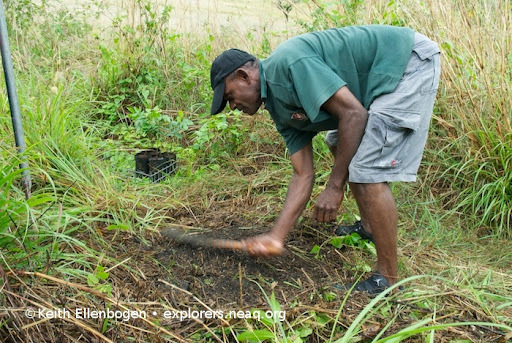 Fiji has launched a campaign to plant a million trees, an excellent start in reclaiming the legions of scorched hills for nature’s life support system. 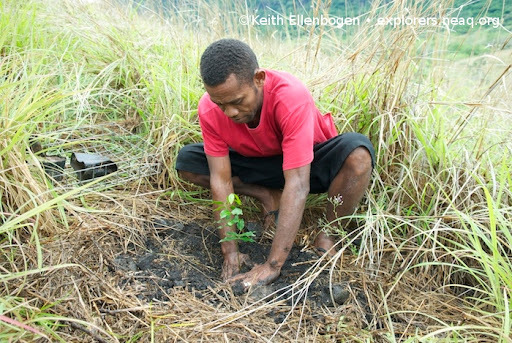 Conservation International and the Institute of Applied Science (University of the South Pacific) have been collaborating with local villages, encouraging residents to germinate seeds of diverse and useful native trees and grow them out to bring new life to the bare, burned hills. A close partner in this work is Fiji Water. Bottled water is an environmentally controversial commodity, so Fiji Water is striving to achieve a carbon-negative operation (remove more carbon from the atmosphere than it generates in the bottling and shipping of water). 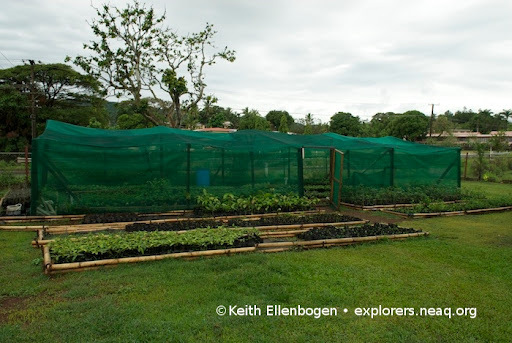 It is doing so by preserving native forest and adding to the forest estate of Fiji through new planting. We visited several of the cooperating villages, shared kava and songs, fawned together over the rows of young trees under innovative bamboo nursery shelters, and laughed and joked in the pouring rain. We also journeyed to a planting area, taking three robust young vesi with us to make our own small contribution to the replanting effort. What we witnessed was the opening strains of a symphony in which each bar is written just before it is played. The tiny seedlings, thrust from their comfortable nurseries into open grassland, shoot roots deep into the ground and throw branches to the sky, year by year transforming dry grass back into wet forest. As they grow, they interact with each other, the water table, the soil, and the sky, gradually recreating an environment hospitable to hundreds of other Fijian plant, animal, fungal and microbial species, and inviting them all to come forth from their precarious hold-outs in tiny remnant forest patches, and spread in their full glory out across the Fijian landscape once again. It is an act as inspiring as science fiction accounts of the terraforming of alien planets, and every bit as bold. Nor do we yet know much about the way life weaves its larger tapestry here on Earth, let alone on Mars. 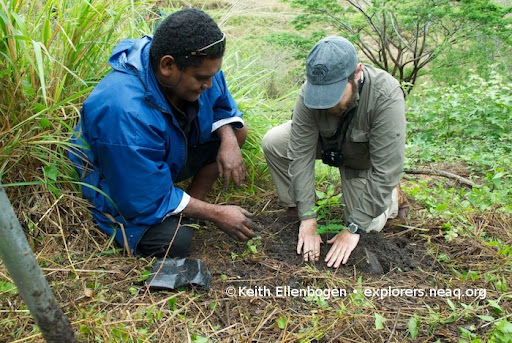 The calling forth of forest in Fiji is a giant experiment in ecology, and a test of the marriage of people to earth and sea. There will be setbacks, and much will be learned, but with the necessary will there is no reason to expect anything but success; success in some continuously evolving form. 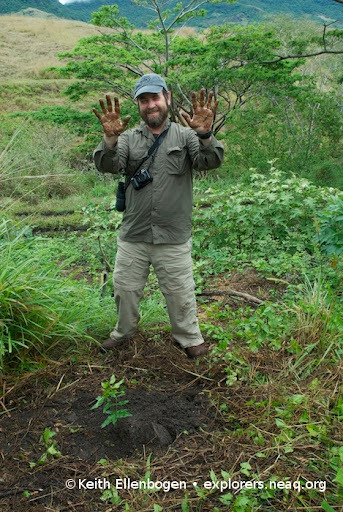 Planting the little vesi had special significance for me, for this was the first time I'd pushed my hands into the Earth to nurture new life, since my own new life began with a bone marrow transplant from my sister four years ago. Along with all the wonderful things that soil holds are a world of pathogens, but I supposed that my adopted immune system was ready for the challenge. What a fine way to rejoin my fellow stewards! Wonderful success story. Write a book--I promise I will read it! Story very well written . I am currently working on a project here in malolo Island Fiji on how we can create more land based activities using nature . Coral Restoration ,Waste management & tree planting etc . We are doing phone calls ,research and conversations with as many .